We aim to provide a wide range of opportunities which give every child the chance to shine and be the best they can be. We are a vibrant and highly successful comprehensive school which reflects the truly cosmopolitan nature of Leeds. You will find the Sixth Form at Roundhay to be diverse, friendly and welcoming. We always put a great deal of effort into ensuring that all students quickly settle into life in the Sixth Form. Celebrating our exam success at Key Stage 4! Celebrating our Sixth Form successes this summer! We are very grateful and honoured to introduce the Professor Rae Earnshaw Scholars and Achievement Fund at Roundhay School thanks to a generous donation by Professor Earnshaw, a former pupil at Roundhay School (1955-62). More information about the Fund to follow in the New Year. Students, parents and carers are invited to our Health & Social Care Careers Evening, taking place on the 30th January at the Secondary Campus between 5-7pm. This is a terrific opportunity to discover more about careers in this sector and speak to a range of healthcare professionals. We look forward to seeing you there! Join Roundhay Creative Arts for this year's whole school musical ‘Sister Act’ - see the flyer for details. Don't miss out - tickets selling fast! 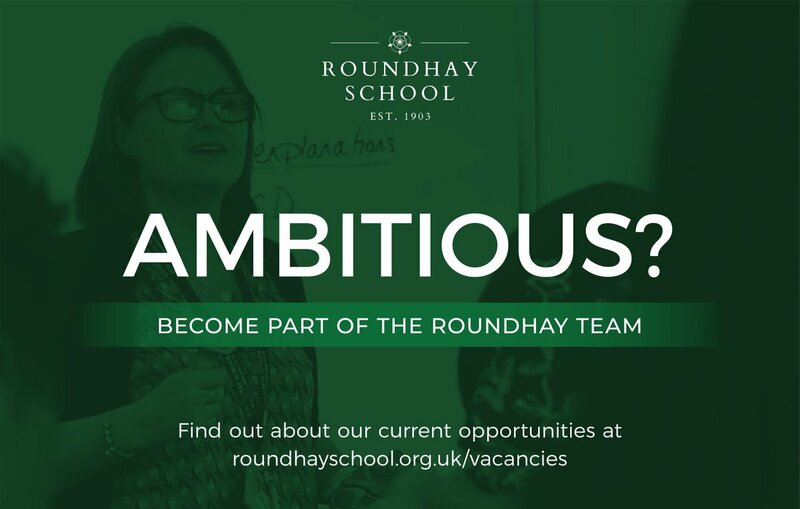 An amazing opportunity to come join our team and work at Roundhay School! See our vacancies page for more details. Information for parents/carers and students about cycling safely. Information for students sitting external examinations this summer. Date for your diaries for 2020 entry to Year 7 or Year 12. Our latest musical production promises to have you rockin' in the aisles! A great opportunity to find out about working in the field of Health & Social Care. Information from West Yorkshire Police about safety. A letter from the Headteacher regarding parking and vehicle access at and around the Secondary Campus. Information about external exams taking place throughout Summer 2019. We very much hope you will gain a real flavour, from our website, of what makes Roundhay such a lively and successful community to learn in! Ofsted judged us to be ‘ Outstanding’ in all categories, stating ‘Roundhay is all about its students’; this underlines that all staff want every child to be the best they can be. To read the full report, click here. We are proud to be the most popular school in Leeds, particularly as we are one of the first all – through schools in the country, educating pupils aged from 4 to 18. We also have the largest Sixth Form in the city with over 500 students.